Brownies are kind of my thing. 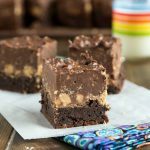 Peanut Butter Stuffed Brownies. Or just regular fudgy brownies. They are pretty much my favorite dessert. We are up to about 30 brownie recipes here on the blog, so there is no shortage of options. 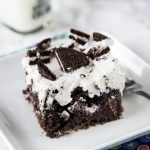 Valentine’s Day is coming up, so today we are here with a decadent and over the top brownie recipe you can share with your Valentine. And not just regular brownies either. 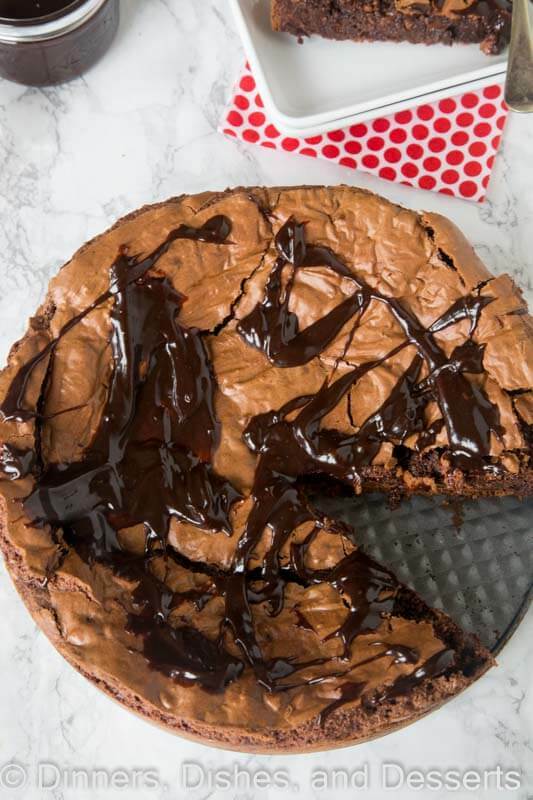 This is a gooey brownie pie, that will make you rethink brownies forever. I can’t remember where I saw this recipe first, but as soon as I saw the picture, I knew I had to make it. Maybe it was shared on Facebook, I don’t remember. But one thing I know, is Ina Garten knows how to bake. 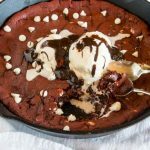 Her Outrageous Brownies are amazing, so I knew this gooey brownie pie would be too. Her recipe called for a chocolate ganache (melted chocolate chips with heavy cream) drizzled over the top. But I wanted to make it a little extra special. So I made Peanut Butter Hot Fudge Sauce from A Dash of Sanity to spread over the top. You could follow the original recipe, use my special touch, or even just use your favorite hot fudge over the top. 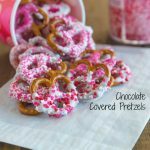 Whatever form of extra chocolate you add will be delicious. 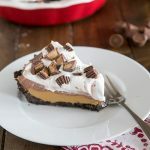 The brownie pie puffs up as it bakes, and the tops gets crackly and delicious. But the inside stays gooey, rich, and super chocolatey. I wanted mine to stay all chocolate, but you could mix in walnuts if that is more your thing. I am not a fan of nuts in desserts, so I skipped that part. So this Valentine’s Day or any day, really. Because chocolate is appropriate every day of the year. 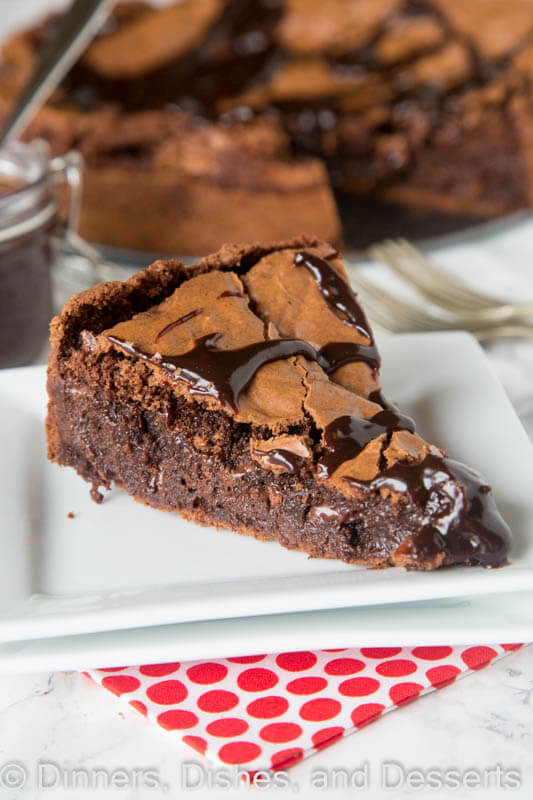 Make this gooey brownie pie for your family or your special someone. 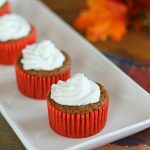 It comes together so easy, so even you non-bakers can master this and impress the people in your life! Spring Form Pan – Use your spring form pan for more than just cheesecake! Your dessert comes out gorgeous, with no messy slices. Hand Mixer: I love these for small batches or quick and easy recipes that don’t require a lot of ingredients. I love that you can have so many color options now, I love the red! Measuring Cups – nothing beats a good set of measuring cups that last a long time. I love metal measuring cups because of their durability. Rubber Spatula – Nothing like being able to scrape any type of bowl clean without scratching it up. Don’t forget one of these babies to get every last bit out of your bowl. 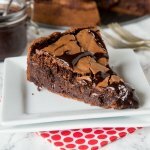 Gooey Brownie Pie - a gooey chocolate brownie with a crackly top baked into a pie and topped with hot fudge. 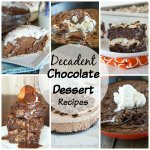 A delicious and easy dessert for any chocolate lover. Preheat oven to 350 degrees. Grease a pie plate or 9 inch spring form pan. In a heat safe bowl melt together butter and 2 cups of chocolate chips until smooth. You can use a double boiler or microwave at 50% power in 30 second intervals. Let cool. In an electric mixer beat eggs, sugar, and vanilla on medium high speed until light and fluffy, about 3 minutes. Mix in the cooled chocolate. Fold in flour, baking soda and salt until just combined. Mix in remaining 1 cup chocolate chips. Pour into prepared pan. Bake for 35-40 minutes until the center is puffed. The top may crack. 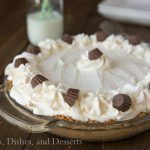 If using a pie plate, I would use about 3/4 of the batter, otherwise it will be too full. OMG! This. Looks. Amazing. 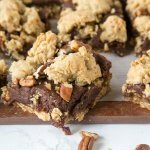 My MIL makes a dessert like this that I LOVE, but the recipe is just way too complicated for me. This on the other hand, looks even more delicious and is something I can actually handle! Love it! First of all I followed this recipe to a tee. Put it in a 9 inch pan and baked and had an absolute disaster. The pan can not hold this pie and so as it baked it spilled over the edge in a burnt mess in my oven and the gooey pie never completely baked . Now I have a mess and no pie for PI tomorrow for my kids school. Sorry for your mess. The recipe was tested in a 9 inch spring form pan, the high sides keep it from spilling over. If using a pie pan, I would try a slightly larger one, but will probably need to adjust the baking time down slightly. Can this be prepped up until baking and kept in fridge? I have not tried that, but Indo not see why it wouldn’t work. I baked this in a deep-dish pie pan, and it was perfect. I agree that a standard 9 inch pie pan would be too small. I’m a serious chocoholic, and this really fills the bill. It’s super rich, so cut it small. We’ll definitely be keeping this on our go-to dessert list! This is a fantastic dessert! And it’s easy, too. I made it for an early birthday dinner for my daughter and her husband and they loved it. I added a bit of espresso powder to enhance the chocolate flavor and drizzled both fudge and salted caramel sauce on top, then served with either vanilla or coffee ice cream. Divine! Thanks for a great recipe. Wow Erin, your recipes look amazing. 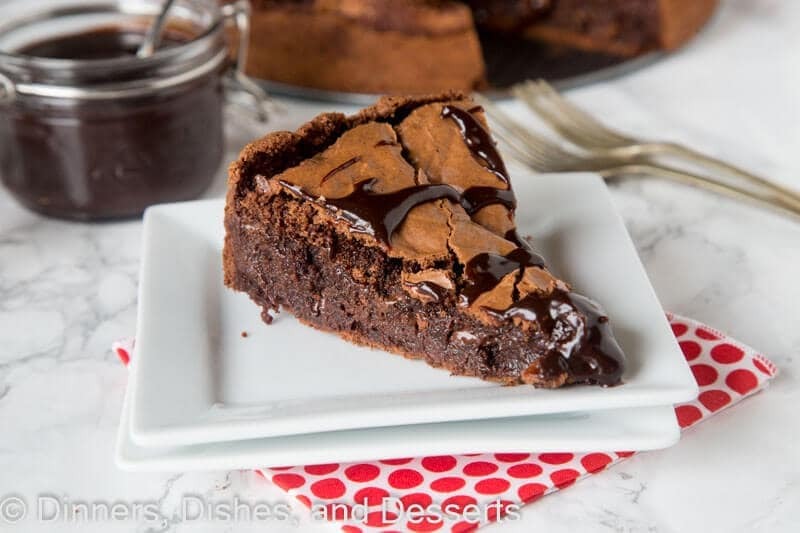 This brownie pie has me drooling! I am not sure how your toaster oven works or the temperature. You want it close to the regular oven baking temp. I do not have a toast over, so I haven’t tried it, but I think it should work. Let me know! Thank you! We’ll see how that goes 🙂 at what temperature is it baked in a regular oven, 350 ? Yes, that is what the recipe directions say to do. 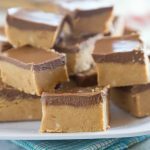 Sorry this may be a silly question… But is there a recipe for how to make the fudge? Do you know the weight of the three cups of chocolate chips? I have baking chocolate I’d like to use but I’m not sure about the equivalent. 18 oz total. 2 cups of chocolate chips is the equivelant to a 12 oz bag. Hope that helps! Omg this turned out sooo good!! And super easy!! Everyone loved this!!!! Will be making more!! Definitely a keeper!!! Hello,I added a bit of espresso powder to enhance the chocolate flavor and drizzled both fudge and salted caramel sauce on top, then served with either vanilla or coffee ice cream. That is for 1/8th of the pie. Last few times I have easily gotten 10 slices – so I updated it. Obviously, the smaller the slice the less calories. What type of flour, I assume all purpose? Yep! All-purpose flour it is. Enjoy! I just baked this and it turned out amazing!! How do you keep the center from collapsing too much as it cools? Mine has like a full inch shelf drop coming from the edge to the middle. DO NOT USE THIS RECIPE! The recipe states to use a spring form pan, because the sides are way higher. That is why the baking time is longer – it is much thicker than if you use a standard pan. I addressed using a standard pan in above comments, and said not to use one. And 1/4 tsp of baking soda and salt is very little, not sure how that is all you could taste. 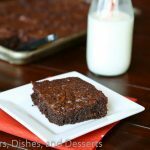 Most brownie recipes call for about 1/2 – 1 tsp of each. Sorry this didn’t work out for you. Made this yesterday, havled the ingrediants as didnt have enough chocolate, it came out perfect, my teenage daughter and her friend ended up eating tge whole thing with icecream through out the day, no idea why one post said all could taste was salt and baking powder. Thats just nonsense!!! Hey Erin! 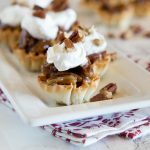 I am planning to make this recipe for a birthday dinner this weekend, but I was wondering if I could bake it the night before. Really looking forward to trying this recipe! 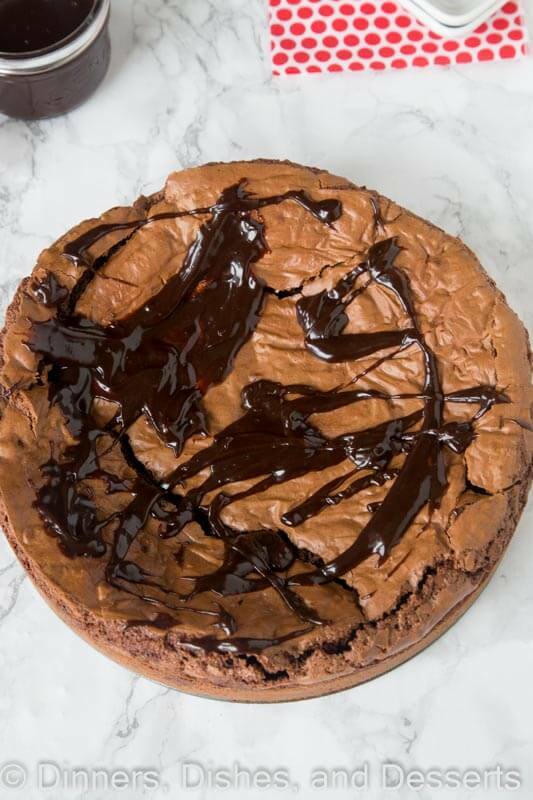 Yep, you can definitely bake it the day before! Just make sure to use a pan large enough so it doesn’t over flow. Enjoy!